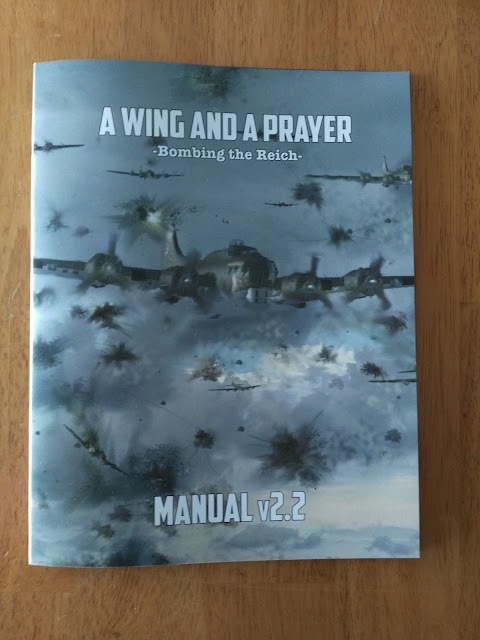 The introduction in the manual starts out "A Wing and a Prayer Bombing the Reich is an easy, fast playing solitaire game placing YOU in command of a squadron of B-17 Flying Fortress bombers stationed in England during World War II, starting from 1942 through the end of the war." Let's see how close this statement is when actually playing the game. The first thing I want to mention is that this review is based on the new version 2.2 manual. 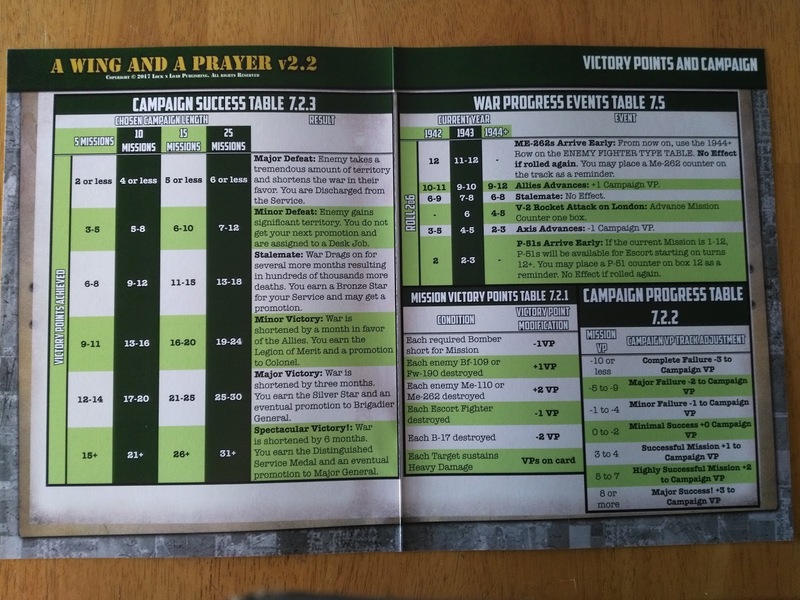 'A Wing and a Prayer' is actually both a solitaire, and a two player game. 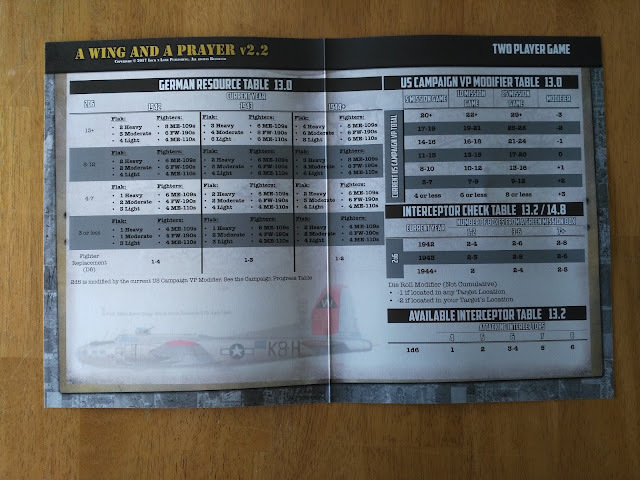 The player commands the aforementioned squadron of Allied bombers (you can also choose B-24s) during the Second world war. With solitaire play, the dice and cards determine what the enemy flak and fighters do. 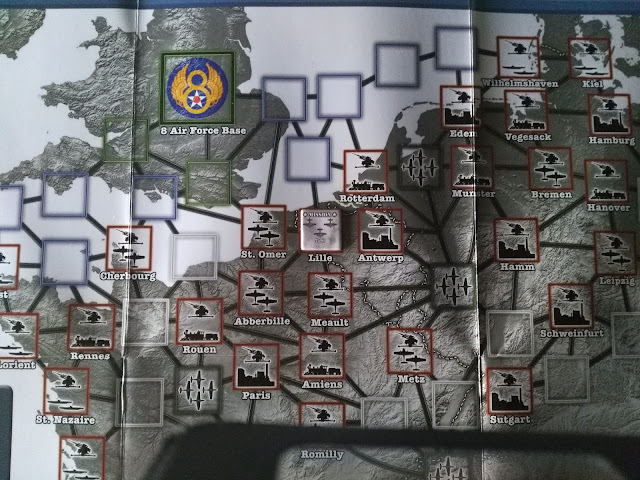 When playing the two player version, the second player takes over the German forces. The map is of northern France and Germany, and uses a point to point movement system to get your bombers over the target. As the errata in the manual shows, there is still a problem with the spelling of four cities on the map. I have to stress that this is the only place where the errors occur and it does not affect game play in the least. The components, including the map, are very well done as far as quality of the items and the art work. The map is actually 19" x 25". 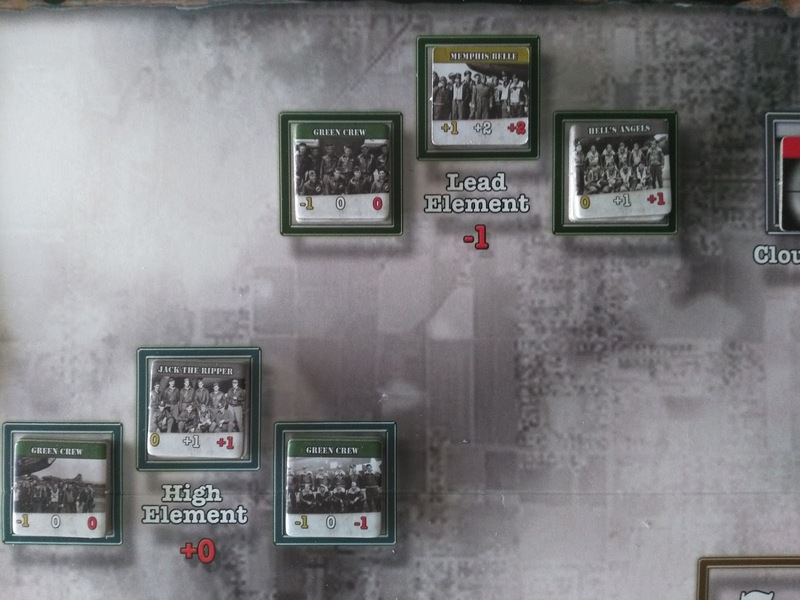 The counters are sized 1" square, and uncluttered with only four numbers on the bomber counters in the corners. 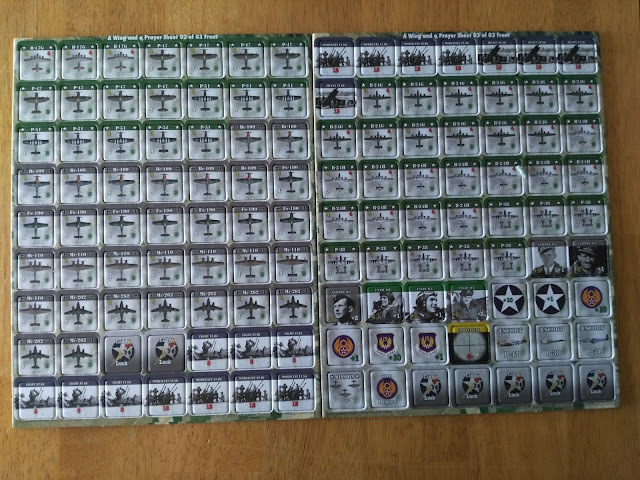 There are three counter sheets for a total of 189 counters. The counters also come with clipped edges for us sticklers. 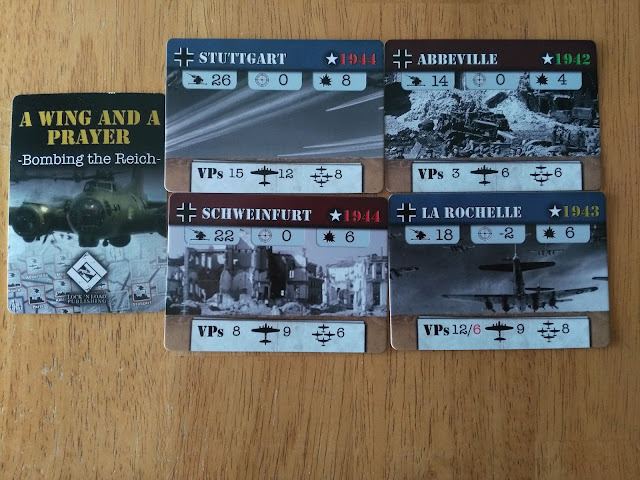 The game comes with seven full sized player aid cards. The tables and writing in the manual and the other components are large and easily read. In the back of the manual there are six pages of logs etc. that can be photocopied, and they can also be downloaded from Lock 'N Load's web page. 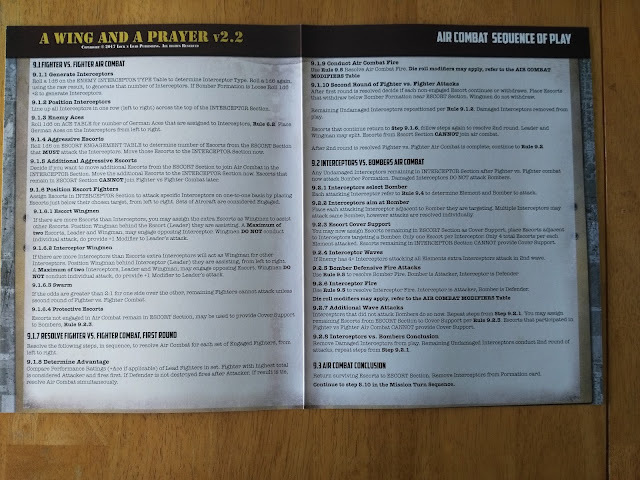 The manual itself is well written and thirty-two pages long. 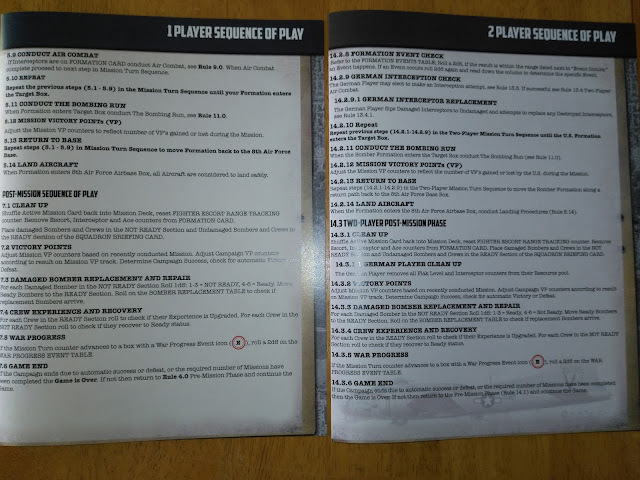 With it and the player aids, one should not have to keep referring back to it for rule clarifications. 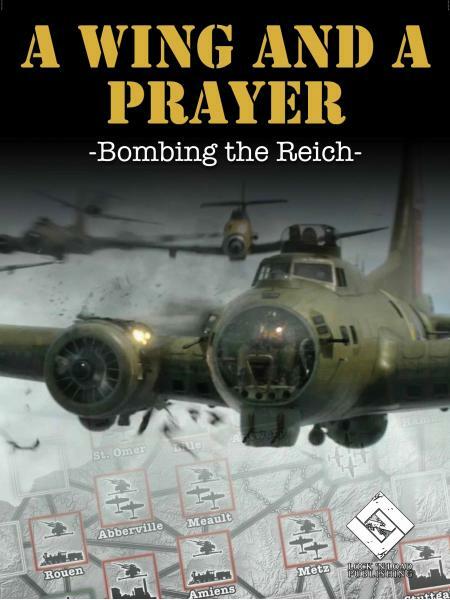 Like other games about the bombing campaign your job as commander, as in real life, is to manage your crews against the damage you can inflict on targets. Your crews will face flak, fighters, and weather. 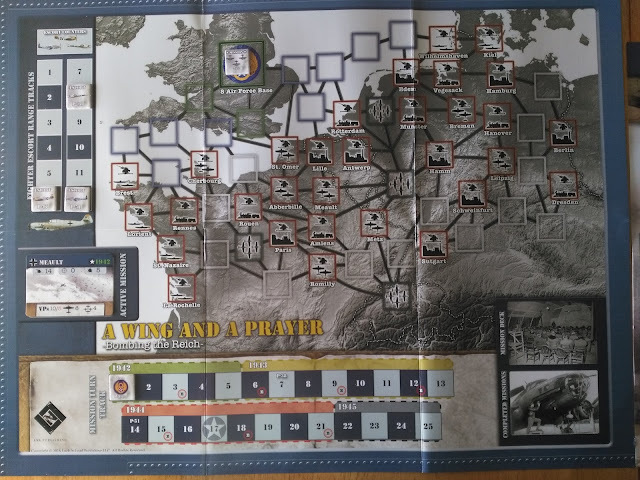 There has been some postings about games like this 'playing themselves'; they feel the player does not have enough input into the game once the mission starts. The answer to that has also been posted. That pretty much was what it was like for a commander in the bombing war. Just like the game, you were given a target and picked the crews and the flight pattern. Beyond simply scrubbing the mission because of losses or weather, there was not much else to do. Your goal in the game is to keep enough crews to make sure the next missions get done. I will go through a mission turn next. The board is all setup and the next step is to choose the target for today's bombing run. The mission will be from 1942 to make it simple. The mission turns seem like the player has a lot to remember, but the game is simpler than it looks as far as having to keep track of things. Naturally, your first few turns will take longer until you get the process down pat. 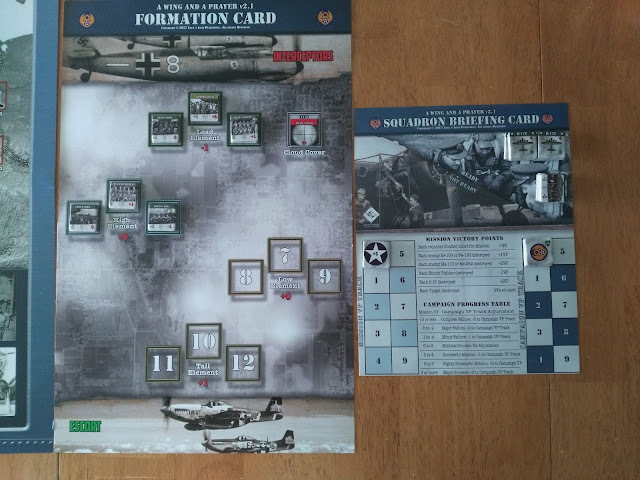 The following pics show the game map, formation card, and the squadron briefing card setup for our first mission. Thanks to Lock 'N Load I was able to download and print another squadron briefing card. The first one was lost in a small coffee flood. This mission is going to be over Meaulte. I have six B-17s to use. The game starts you off with one crack, two veteran, and nine green crews. The green crews are not named as the veteran and crack crews are. My crack crew is naturally 'Memphis Belle', and my two veteran crews are 'Hell's Angels' and 'Jack the Ripper'. For escorts in 1942 you have P-47s that have a range of six. I have four escorts available due to lucky rolling. You also roll and check for 'fighter aces' with your escorts, and also with enemy fighters. Unfortunately I rolled no fighter aces for my escorts. Nothing has happened over the two channel spaces, and luckily over Lille the die roll for a flak attack came up nil. Now we get to the bombing mission itself. You first check the mission card for the flak rating of the target. In this case Meaulte has a rating of fourteen. 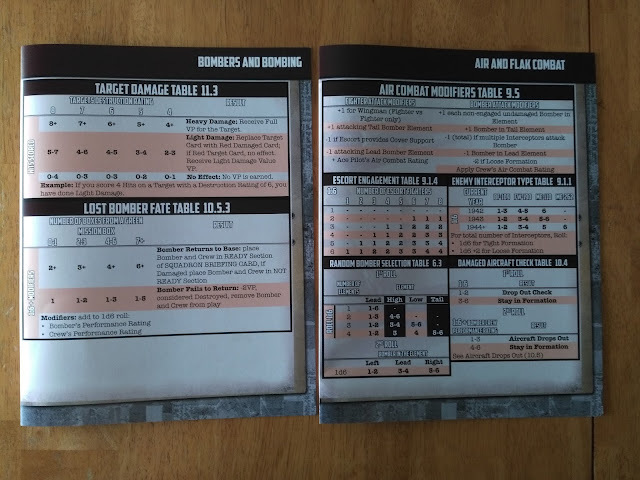 So then we check the 'combat table' to see how many one die rolls we roll against each bomber to check for flak damage. In this case it is three rolls, and each roll of six indicates damage. I have lucked out once again, and suffered no incoming flak damage. Remember this is still early in the war and I am not making a bomb run against deep enemy targets. I still have to check on 'egress' flak after our bombing run and also see if enemy fighters attack my bombers. The roll for enemy fighters puts one FW-190 in the air against us, and it is also piloted by an ace. We can use two interceptors against him and our luck is still holding out. The FW-190 is destroyed. Now we get into the bombing run itself. Unfortunately, because of only six bombers and the fact that Meaulte is under heavy cloud cover, the bombers score only two hits and inflict no damage. The egress (thank you P.T. Barnum) flak does no damage either. Our trip back home over Lille again and then over the channel is uneventful. The game to me is an excellent representation of the bombing campaign. Once your target and crews were chosen there was not much else to do but hang on tight and pray. 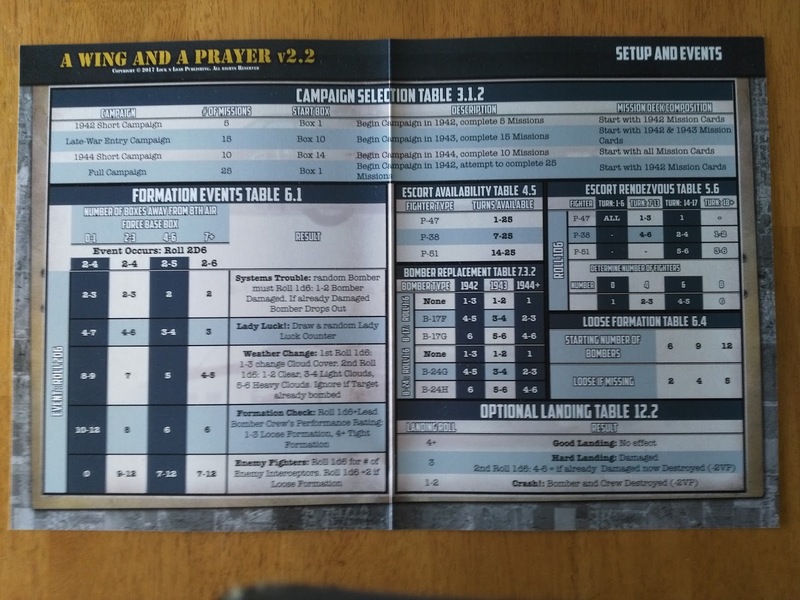 The players' choices before the mission starts are the largest factor in how your mission will go. Of course, with this many die rolls to check each time you move into a new hex, lady luck does have a large part to play in it. There are also die rolls that can give you a 'lady luck' counter to be used during your flight. I have not had a chance to play it as a two player game. As the German player you have the chance to increase the flak attacks, and you are in charge of your interceptors. You are not allowed to change history by, for example, building more ME-262s, or building them sooner. Actually both sides pretty much play exactly the hands that history dealt the people whose shoes they are filling. 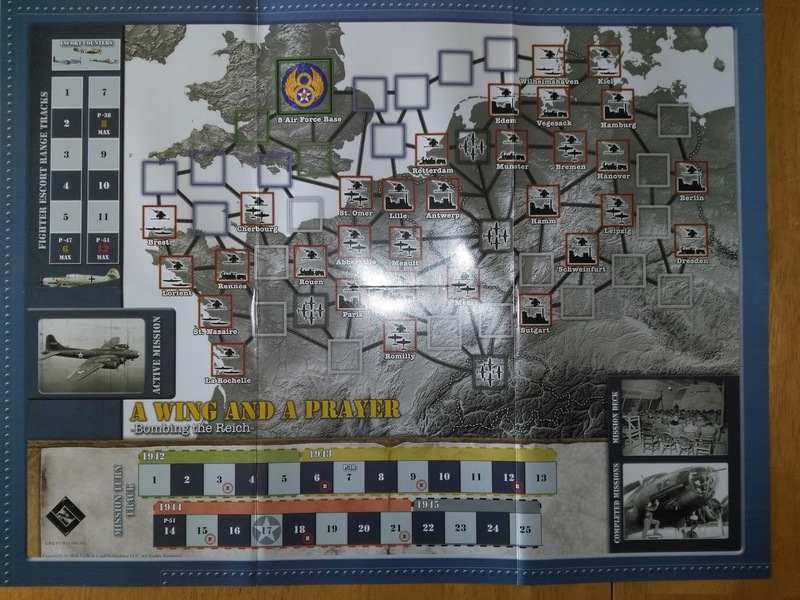 This is my first Lock 'N Load boardgame, and I have to say I am impressed. I have played a lot of their different digital games like 'Command Ops' etc. down through the years, and have really enjoyed them. The AI in them is amazing.